The Marie Azary Rock Garden presents a range of plants suitable for our calcareous (high pH) soils and water. In this garden, succulents, tight cushions, creeping mats, and silvery foliage abound. These growth forms allow the plants to cope with the naturally hot and dry conditions of exposed crevices and cliff faces. Many of the plants are quite small, so look carefully. While the peak bloom is in spring, the plants are of interest throughout the growing season. Several that grow here are the original plants from Marie Azary. All of these plants are hardy to this area, provided their unique growing conditions are met, including specific drainage requirements. Many rock gardens use volcanic rock to create the small pockets of soil and correct drainage these plants need, but we have used a local rock source called tufa. The porous tufa rock is formed at and below ground level in special alkaline conditions. 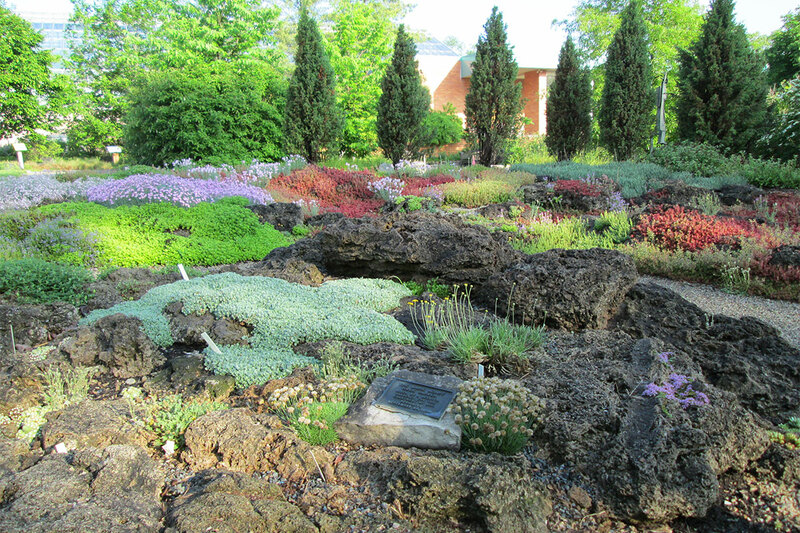 The Marie Azary Rock Garden is at the Matthaei Botanical Gardens site. Marie Azary was a devoted gardener, rock garden enthusiast, and supporter of the Gardens. She donated her rock garden for all to enjoy in 1985, and it is the foundation of the garden you see today. The North American Rock Garden Society has funded extensive reconstruction and replanting of the garden. If you would like to help support the Rock Garden, please contact Meredith Olson, our director of development: merolson@umich.edu; 734.647.7847.